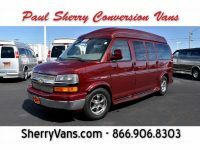 As part of our extensive inventory at Paul Sherry Conversion Vans, we proudly offer a range of Chevrolet conversion vans. 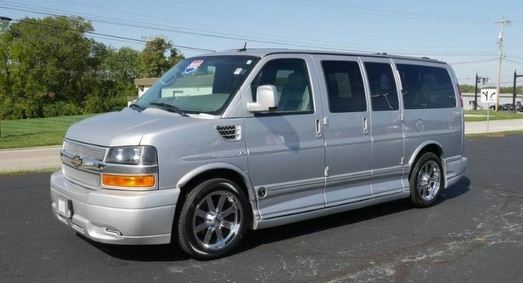 They are based on the Chevrolet Express and offer a range of options. You can find various conversion types or a passenger van, choose among the various model years, or choose based on price, color, engine, or other factors. 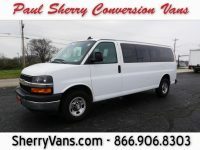 The for-sale Chevrolet conversion vans at our dealership include a variety of specs, which vary based on the Chevy Express version it is based on, as well as the specific conversion type. Some are based on the Express 1500, but you can also find one from the Express 3500, the common base for those models that comes with a greater passenger capacity. 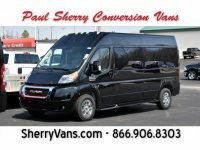 From there, you can choose a passenger van, mobility van, or another conversion. 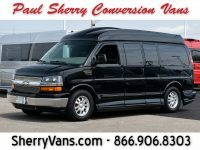 Although the Chevy you select will vary based on the model year, conversion, and base you select, most of our Chevrolet conversion vans share some common factors. Almost all use a 5.3-liter Vortec V8 that has proven its reliability over the years. This engine also produces more than enough power to get the van moving and maintain highway speeds, even when it is fully loaded. 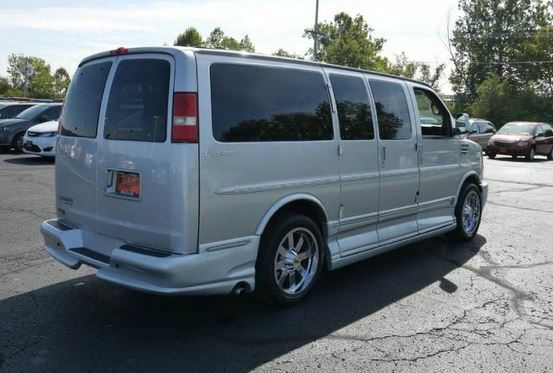 You will also spot the occasional Chevy conversion van with another powertrain, like the 6.0-liter Vortec V8 on Express 3500 models. Expect the conversion vans to use rear-wheel drive. 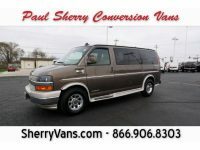 Other features on the vans can include premium cloth or leather seats, auxiliary stereo inputs, front AC power outlets, CD players, heated mirrors, high top raised roofs, rear HDTVs with DVD players, and rear sofas. All used models will have clean vehicle history reports from AutoCheck, providing you with peace of mind. 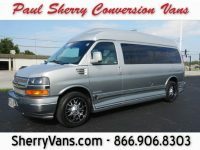 For anyone in the market for a Chevrolet conversion van, buying from Paul Sherry makes logical sense. We go out of our way to provide you with all the information you could possibly need about the vans before you even visit the dealership. Our online inventory provides individual vehicle specifications and descriptions on each vehicle’s unique page. Most also have photos as well as a video showing off the various features in more detail. Our dealership also has an experienced financing department that can work with you, regardless of credit history, to get you the auto with the lowest available loan rate. We will compare the offers from various local credit unions and national banks to get you a rate you can afford. 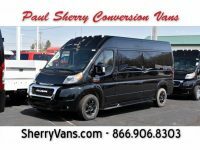 Paul Sherry is also one of the few dealerships that offers delivery to all 50 states; we have this service available to help customers without a conversion van retailer near them. Thanks to our delivery option, you can buy a van from our dealership regardless of where in the country you live. This is particularly useful for those with mobility issues restricting movement, but also allows those without options nearby to buy from the comfort of their homes. Over the years, we have developed a seamless system for conducting transactions without you having to visit the dealership, giving you the same hassle-free process whether you buy your conversion van in person or have it delivered. 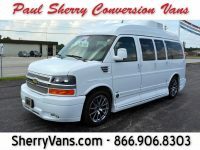 Take a look at our online inventory to get a feel for the Chevrolet conversion vans we offer, then visit our dealership or give us a call to make your purchase.